I scream, you scream, we all scream for ice-cream! Students: How are you doing? Do you feel like screaming yet, now that midterms are upon us? 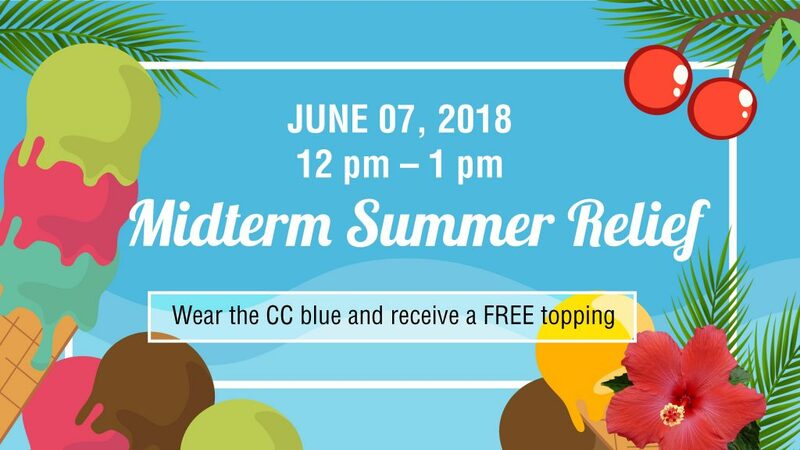 The Student Committee knows you need some Midterm Summer Relief! Whether or not you’re feeling blue, the Student Committee wants you to wear the colour of Coquitlam College, blue, this Thursday to show your support of each other during midterms, as well as to benefit the BC Children’s Hospital! And what better way to make yourself feel great and to enjoy summer than to enjoy some ice-cream? Stop by the main foyer before or after your midterm on Thursday June 7 at lunch time and feel some relief from this Summer semester.